In France they say love is around every corner and why wouldn't it be? 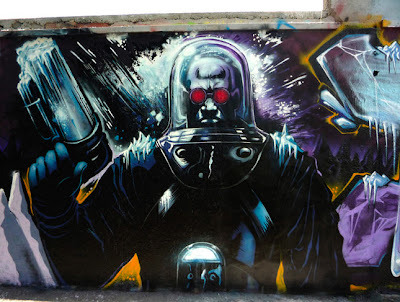 Especially if around said corner, street artist FLOW has done one of his stunning graffiti art works on the opposing wall like Mr Freeze right there. I mean faced with that much talent it'd almost be rude not too. 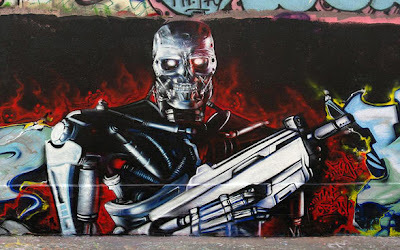 Man, not only does Flow have a mad talent with power-packed murals, his work proves why the French Tourism Board or whomever ought to be shot. I mean if these beauties were in all the fliers instead of that tower thingee again and again and again, maybe a few more folks would visit the place! well i guess this means France has at least one thing going for it now. Two Dave - can't forget the food mmmm - and the capital of all great food Italy, is just a stones through away as well! That Mr. Freeze is perfect. France still has a way to go to make up for ....well for being France. But this is a good start. and here comes my wing man! good one Craig! Well the capital of good food is Portugal if you'll believe my word. I've been around europe, I know what I'm saying. But yes, in france, they have crepes and crossants, and an attitude that makes you find frenchmaen interesting even when they say the croissants "son fini". Italian food is good, obviousely, but really, there is nothing like the variety, texture and taste in portuguese food. That catwoman and joker were amazing. Thanks guys! the Freeze and the Feline were my favourites too - now there's a cool Gotham mini series title - Freeze's next wife? As for Portugal Aliera, I'll have to take your word - though it would be hard pressed for my tastebuds to move from thinkin Italian was tops. I mean it has pizza for one! And many other great dishes to hard to type the names of in the early hours of the morning!